Workers’ Compensation Requirements for Iowa Employers | Hupy and Abraham, S.C.
Iowa employers are required to have a way to compensate their employees for any work-related injuries (with limited exceptions). For the majority of Iowa employers, this means purchasing workers’ compensation insurance from a private insurance company. However, Iowa does provide an alternative to employers who are required by law to have workers’ compensation insurance. Iowa employers who choose not to purchase workers’ compensation from a private insurer may be self-insured, as long as they follow the statutory rules for self-insurance. Hold the security in trust so that it is available should any worker make a legitimate claim. 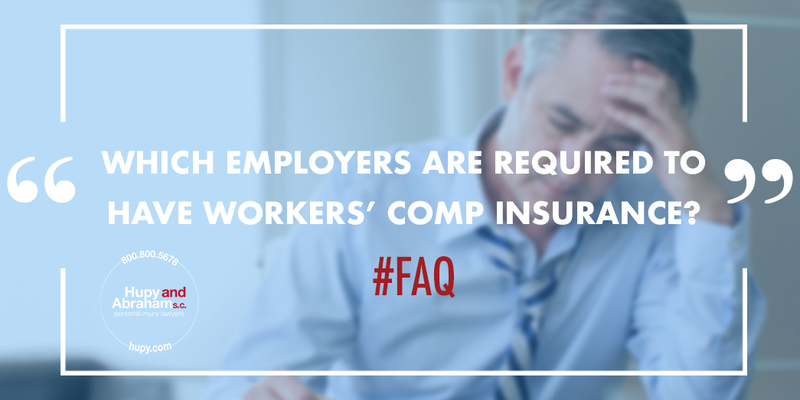 Employers will be required to provide additional proof periodically as required by the insurance commissioner. There are also specific rules about when an employer may stop being self-insured. What If Your Employer Doesn’t Have the Required Workers’ Compensation Insurance? Your employer could face significant legal problems—including criminal charges—for failing to have the required workers’ compensation insurance. Your employer’s mistake should not prevent your fair recovery of benefits for a work-related injury, but you will likely need help fighting for the fair recovery that you are owed. If you have been hurt in a work-related accident and you are concerned about whether your employer has workers’ compensation insurance or you have questions about how a workers’ compensation case works, then we encourage you to contact us as soon as possible to set up a free, no-obligation consultation with an experienced lawyer. Posted on 05/10/2017 What Can You Recover After Losing an Arm, Leg, Finger, or Toe in an Iowa Work Accident?